Stockholm Alternative is an exclusively bespoke and holistic tattoo studio in Gamlastan, Stockholm. This very friendly and "zen" studio is owned by the Internationally known Swedish transgender artist, Touka Voodoo. This is a highly professional studio with an exceptionally unique quality of work. 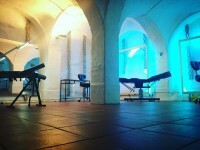 The ultra clean, large and spacious Medieval rooms partly built in the 13th century and partly in the 17th century are ideal for privacy and for a meditative experience as an alternative holistic approach to tattooing is one of Stockholm Alternatives principals. The atmosphere is rather avant-garde and so are the clients. The studio often features world renowned artists from across the globe as guests, to find out more visit the studio during opening hours or start by visiting the website or Instagram @stockholmalternative.